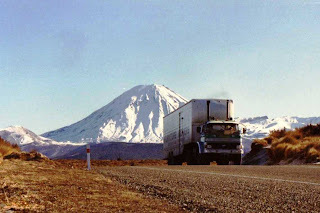 For many years in NZ the British trucks were the backbone of the trucking industry. Fords, Bedfords and Commers in the light and medium weights, while the heavies were covered by Leyland, AEC, Foden and ERF to name a few. The lighter weights are now covered almost exclusively by Japanese makes, while the heavier class is mostly made up of European and American brands. 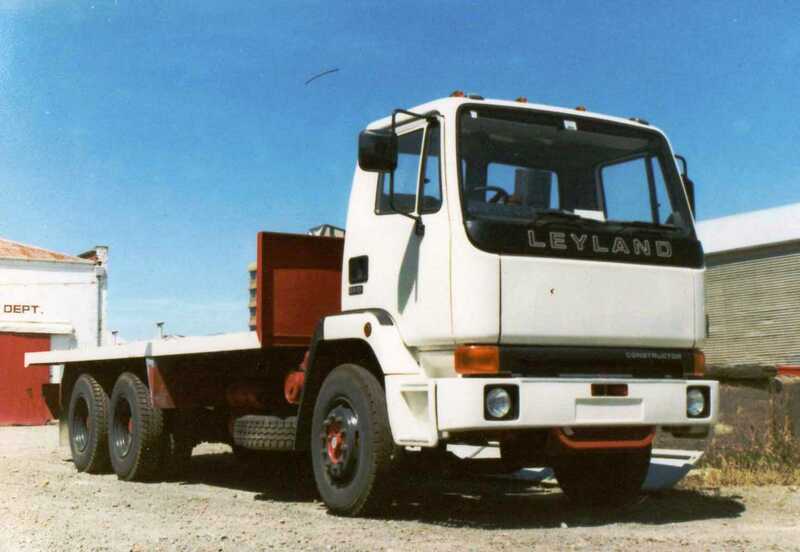 The last of the Brits to be seen on the market were the Fodens which were part of the American Paccar Group at this stage. 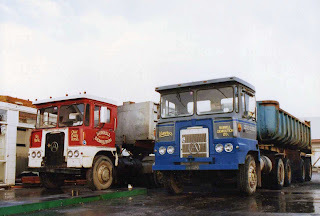 Consequently there are still quite a few "late" model Fodens still earning a living and some ERFs to a lesser extent. A late model "B" series ERF with high roof sleeper and well sheeted load heads South through Taupo in the late afternoon sun. Taupo is a medium size town in the central North Island adjacent to NZs largest lake of the same name. It is well known for it's trout fishing and boat related pastimes. In the holiday season Taupo's population can more than double. 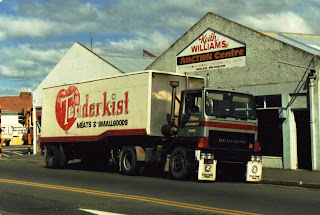 A 250 Cummins powered Seddon-Atkinson unloads beer at the Masterton Cosmopolitan Club. 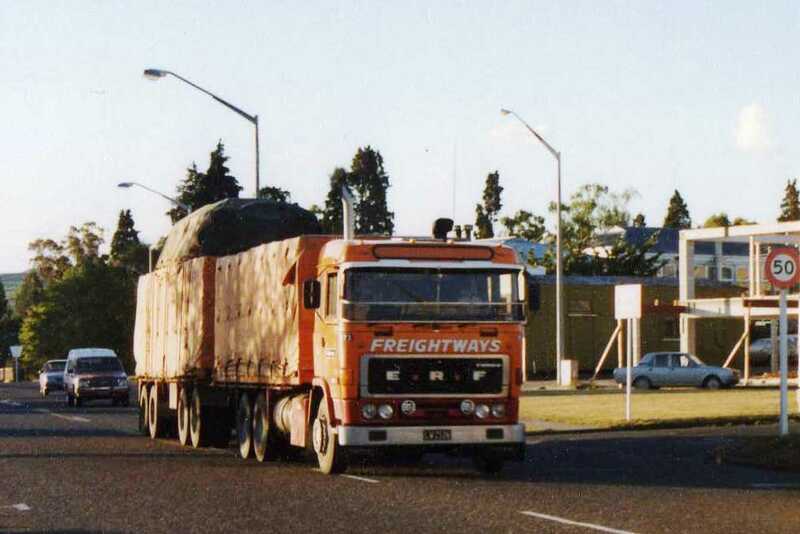 Dodges and Commers were quite popular in the medium 2 axle class. This ice-cream carrying unit is a 1981 RG11. 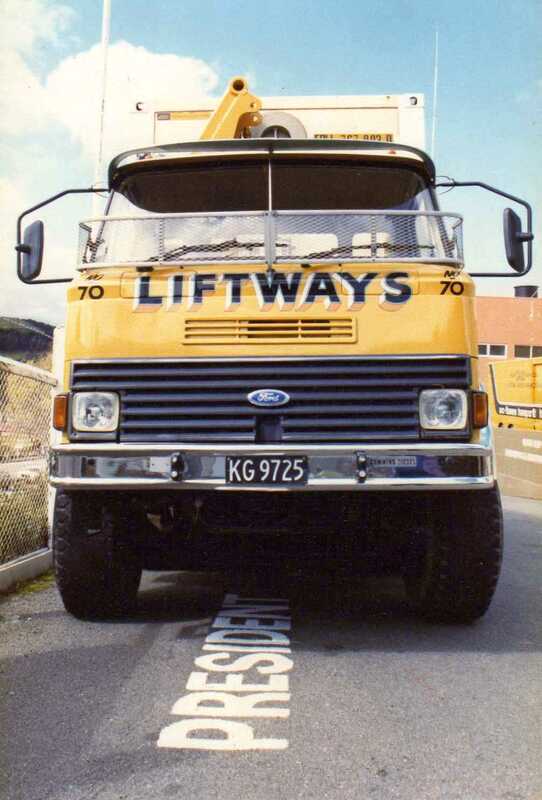 Extra wide front tyres adorn this D series Ford which is set up for carrying containers, self loaded by the trucks own lifting gear. Fairground equipment is hauled by this 1980 Commer Maxi. With tall exhaust and inlet stacks this D series Ford tows a furniture van across the Desert Road in the central North Island. 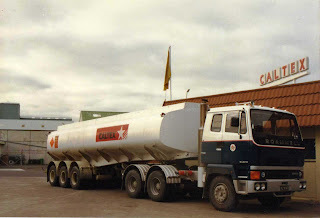 A Scammell T45 unloads fuel at FCDCs garage in Masterton. 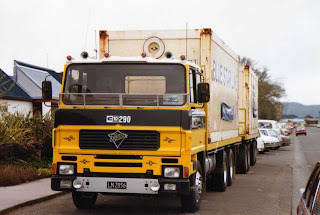 Two Australian cabbed Atkinsons of Burrell Demolition are parked up for the weekend after a hard week of clearing a site for a new supermarket in Masterton. 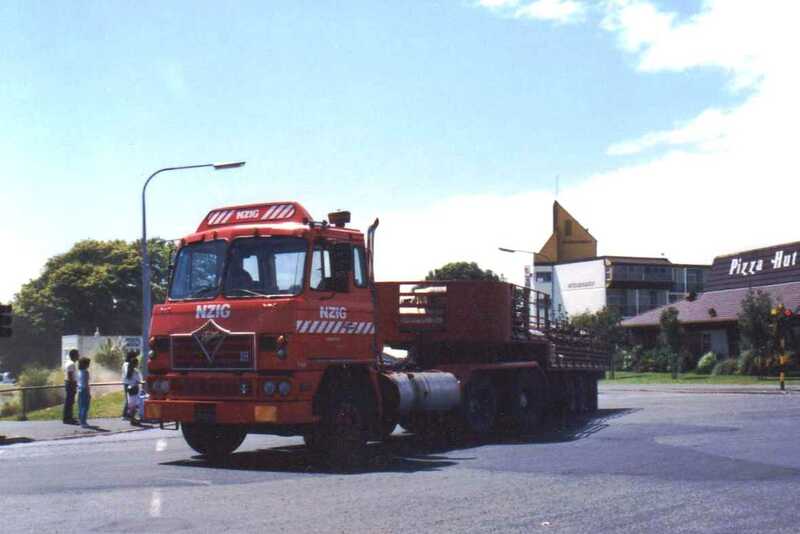 With a load of gas bottles this New Zealand Industrial Gases Foden turns through an Intersection in Hamilton. Hamilton is NZs fourth biggest city. Sanitarium Health Foods operated this D series Ford with self-steering semi to deliver it's products to supermarkets. 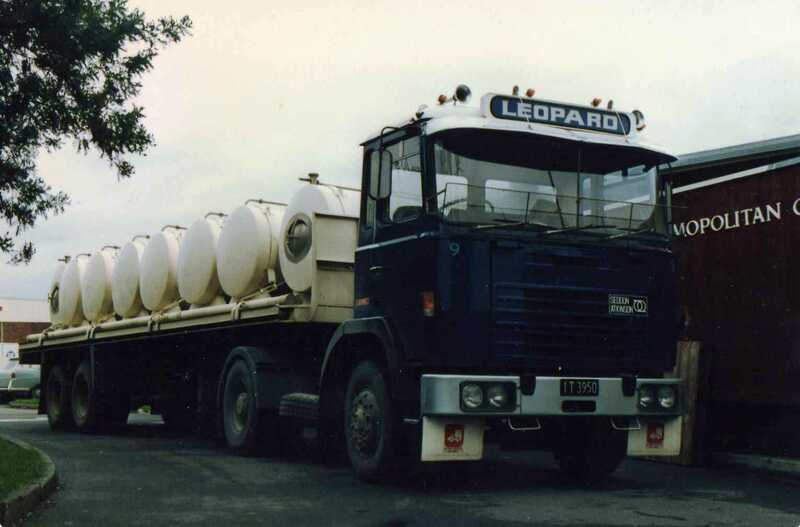 The cab has been raised on this unit to enable it to be re-powered by Detroit Diesel. The tray has just been fitted to this brand new Leyland Constructor. Next will come the signage and then registration. Next it will start earning it's keep. By now it has probably finished it's days of toil. Tenderkist Meats were distributed by a contractor with this "Narrow" cabbed TM Bedford with 6v-71 Detroit two stroke diesel power, a standard fitting for TMs on the NZ market. For many years the most common Cummins engine were the big 14 litres in many different power ratings. This meant that in the lower power classes the engines were low stressed but penalised the vehicles tare weight. 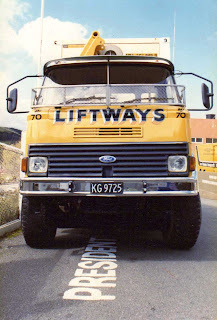 In the late 70s Cummins introduced the much lighter 10 litre series. This then new Foden has a 290hp L10 under the cab. 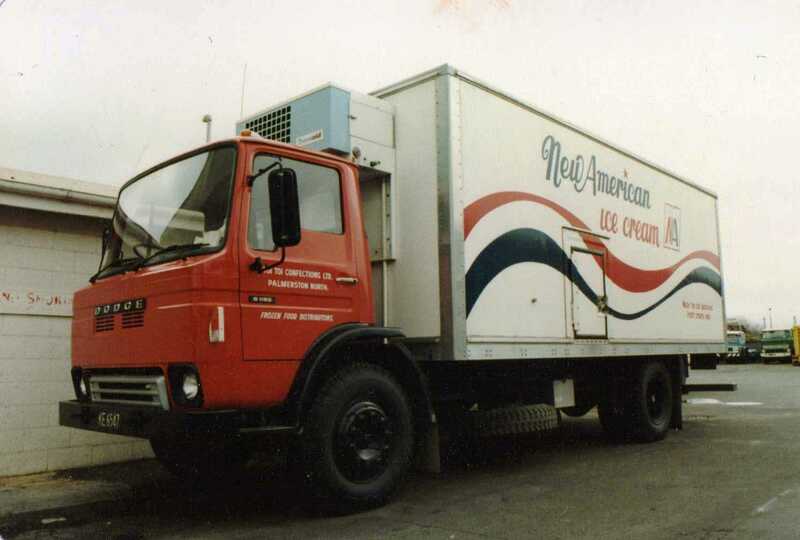 I hate to tell you this, Trevor, but that New American Ice Cream truck is a Dodge, not a Commer. I know you don't actually say that it is a Commer, but I think your comment implies it. Good to see those photos of the RP cabbed Atkis as well. 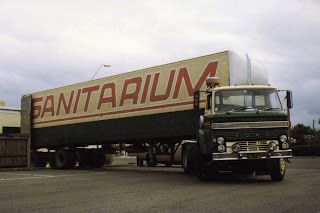 I used to drive Atkinsons for Mobil in the 60s and 70s with all the different cabs, Preston, Taylor-Hull, RP and T-Line' the Australian RP cab was definitely the best. I should look at my photos more closely Vic. 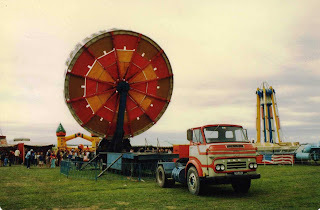 I had it entered in my photo album as a Commer and didn't read the name on the front. Oh well it was only badge engineering anyway!